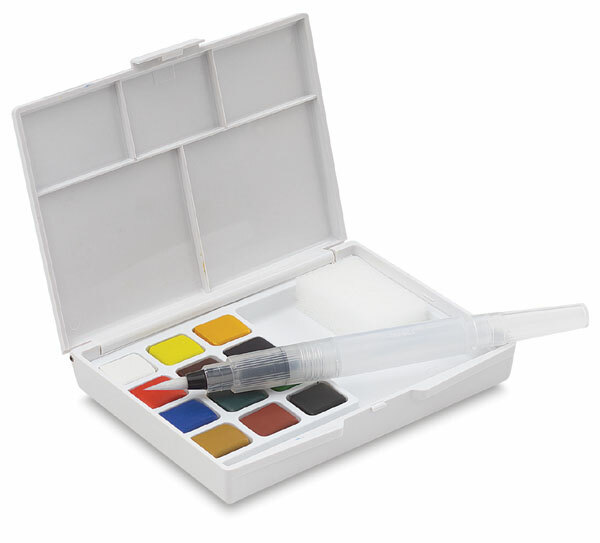 Watercolor enthusiasts find Koi Watercolor Pocket Field Sketch Box Sets easy to take along. Lightweight and affordable, these convenient sets slip into a shirt or jacket pocket. They're perfect for travel and plein air painting. Kits contain half pans of Koi Watercolor and a refillable water brush. This compact travel kit offers 12 assorted half-pan colors, a refillable 4 ml water brush, a sponge, and convenient mixing wells molded in the cover. The set measures 4½"H × 3½"W × 1"D and weighs 4 oz.